We got a blink-and-you'd-miss-it teaser trailer for this summer's next Transformers video game today at a Hasbro toy showcase in New York City. That little bit promises a Transformers game from a good development team, a team that's sprinkling in a dash of car combat. The new game is from High Moon Studios, creators of last year's well-received Transformers: War For Cybertron. That game took place in its own version of the Transformers universe. Dark of the Moon, however, will tell a story that leads into this July's third Michael Bay-helmed Transformers movie, also subtitled Dark of the Moon. The game trailer showed Bumblebee, that famous yellow Autobot, driving out of the back of an airborne cargo plane, turning into a robot as he plummeted to Earth and then transforming into a car armed with guns as he hit the ground. An Optimus Prime voice-over boasted that Transformers can have many modes, suggesting that we'll be playing Transformers who can do more than simply turn from vehicle to robot. A High Moon developer later confirmed to me that players will be controlling Transformers across three modes: robot, vehicle and armed vehicle. Imagine, for that last category, a sports car armed with a half-dozen machine guns and cannons. There will be online multiplayer of some sort for High Moon's Xbox 360 and PlayStation 3 versions. Other developers are creating Wii, DS and 3DS versions of the game. The movie-based Transformers games haven't been very good. High Moon's non-movie take in 2010 was seen as a welcome improvement in quality. 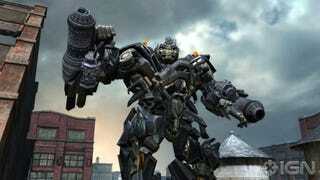 With the new game, the developers will show whether their skills transfer to the movie Transformer universe. The new movie will be out in July. The game is slated simply for summer, possibly before or after — publisher Activision isn't saying just yet.